MACRA — the Medicare Access and CHIP Reauthorization Act of 2015 — has many pieces, but the idea is simple: Help medical providers make the transition from traditional payment-for-service models to reimbursements based upon the quality of care they deliver. To achieve that goal, the Centers for Medicare & Medicaid Services is introducing new quality measurement programs beginning January 1, 2017. In general, providers will be subject to a Merit-based Incentive Payment System (MIPS), which will produce a score based upon four measures: Quality, Resource Use, Clinical Practice Improvement Activities, and Advancing Care Information. These replace the familiar categories of Meaningful Use, PQRS, and VM, but the goal remains to measure performance as accurately as possible. 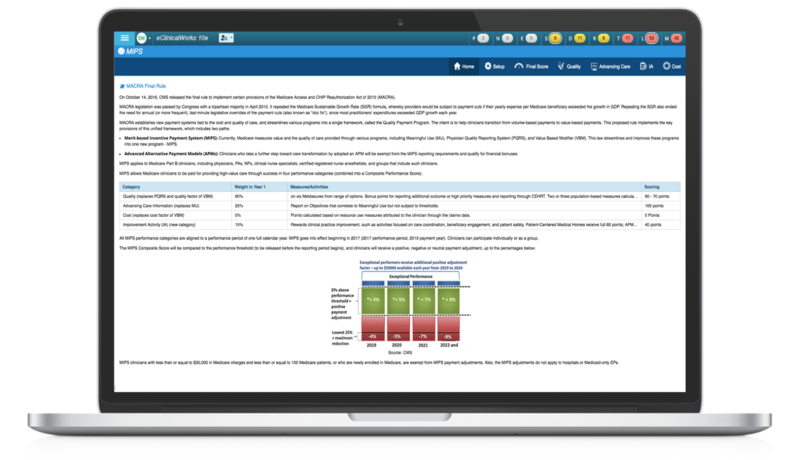 eClinicalWorks provides dashboards that show easy-to-understand summaries by provider or practice. 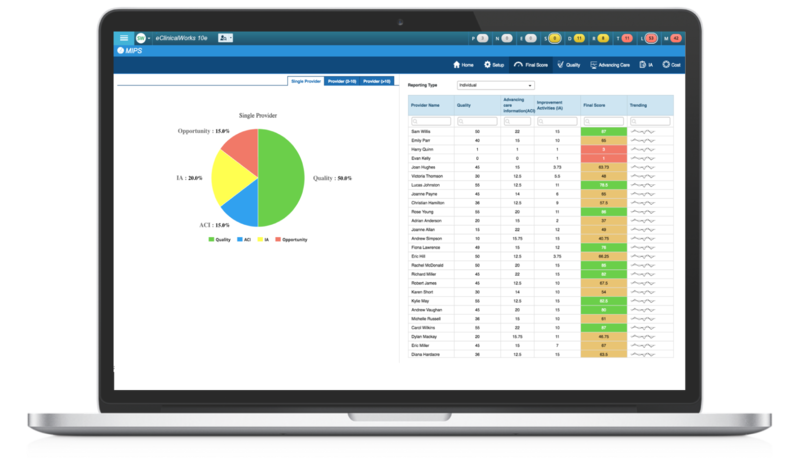 There are dashboards for single-provider and large-group practices. We also offer weekly free webinars on MIPS and Advanced APMs, and a MACRA page at my.eclinicalworks.com. For more information, contact macra@eclinicalworks.com to schedule a demo with our Subject Matter Experts. Do MACRA, MIPS, and APMs still have you confused? Let’s clarify the future of healthcare reimbursement. Click here to watch Adam and Rohan’s presentation from this year’s National Conference. Adam: Hello, and welcome to this edition of the eCW podcast, I’m Adam Siladi. If you’ve been to one of our National Conferences, you know that eClinicalWorks is always keeping up with industry trends and looking ahead to what’s next – this year is no different. With the advent and passage of MACRA, the Medicare Access and Chip Reauthorization Act, and here to speak with me about that today is Rohan D’Souza, from our Population Health team, to try to fill in some of the gaps that might be there and questions that you might have regarding this program. Rohan, thanks for being here. Rohan: Thank you, Adam, for having me, and I hope I can do justice to this really, really big topic. Adam: Knowing you, I’m sure you’ll do a great job, Rohan. So let’s just start off with what MACRA is, because we’ve seen some surveys out there that might indicate that people don’t even fully know what this program is and what it means to them. Rohan: Yeah, Adam, so you’re absolutely right, there’s a lot of anxiety I feel like even though we’re in election season, the next talked about item is MACRA. Really, what MACRA is, as you mentioned, it’s the Medicare Access and Chip Reauthorization Act. It really is your biggest change to payment reform that’s coming to providers and health systems that’s going to impact almost everyone. And it really is removing a flawed or a hotly debated and contested way of reimbursing, called the SGR, or the Sustainable Growth Rate, and it’s taking that away. So Congress and folks in healthcare policy have been really working on this, I would say for the last three or four years. We saw an interim rule that came out a couple months ago, and the final ruling dropped on us about two weeks ago, in fact a week before our National Conference. Adam: Right, there was a lot to do to get ready for that, but, of course, MACRA doesn’t just repeal the SGR, it also makes some fundamental changes to the way that providers are paid for their time and their work, right? Rohan: Yes, absolutely. I think the jury’s out that Medicare really wants to move people towards reimbursement, towards a valued perspective versus a quantity perspective. You hear these words being used a lot called value-based payments, Accountable Care Organizations, etc. I think MACRA is really that first taking a broad brushstroke across the entire country with reimbursement, and saying ‘We’re going to try to maintain reimbursement tied to the quality of care that’s being delivered and really not towards the quantity of care that’s being delivered,’ and that’s the biggest change we are seeing. The other thing that really is coming to light with MACRA, is that I think CMS took note of a lot of the challenges that happened in previous programs, specifically with Meaningful Use, PQRS, and the Value Modifier. Looking at these as being three separate programs, MACRA really likes to put these things together. Adam: Right, combining those separate programs into one, of course, is a big thing here with MACRA, but with all of this change that we’re talking about, with reorganizing type activities that are going on, I think the big question people are going to have is, and the thing that we should answer first is, do we have to be worried, do providers have to be worried about this change? Rohan: Yeah, that’s a good question Adam — obviously we’re biased towards our company, eClinicalWorks, and our message is no, you should not be worried about MACRA. It really is a program that is going through a modification. And the biggest message that we want to give practices is that you’re already used to doing a lot of these things. Practices are already well aware of the words Meaningful Use. Whether you’ve been doing PQRS or whether you have not been doing PQRS, more than likely you know what PQRS is. And folks are well aware of the QRUR reports and what’s been happening with the Value Modifier. The real thing with MACRA is a lot of this anxiety around ‘Oh my god, is this a completely new program?’ — when, in reality, it’s the consolidation of these three programs, with the addition of a new flavor, really around protocol and process changes, to come to one consolidated program, called the Quality Payment Program or QPP, specifically under the MIPS side of MACRA. So, there is a lot of anxiety out there, people are nervous. You hear these podcasts, not by us, but podcasts across the industry that are talking about ‘MACRA’s going to be really, really challenging and you must be doing something about it now, or you’re not going to survive.’ If you listen to what CMS is saying, specifically what Andy Slavit has done, as acting administrator of CMS, he’s really gone out and said ‘Folks, we’re really making this easier, we’re going to value those people or reward those people who really believe in value-based care, who really believe in succeeding as a primary care office or a specialty office, as a small independent provider.’ You don’t have to attach yourself to a large health system, or these bigger delivery networks in order to succeed, which is sort of what the message is being portrayed, depending on who you talk to. Adam: Definitely we’ll be talking about the final rule in just a bit here, but let’s get into — and of course how that final rule affects different groups like specialists, perhaps — but let’s get into the different tracks and the different paths that are available. What does this look like when the rubber hits the road, or when everything hit the fan, I should say, and how are we going to be organizing ourselves under this program? Rohan: Sure, great question, Adam. If we look at it as we’re at a junction, and we’ve got two options, we’ve got a path that goes left and one that goes right. One of it is where most of the folks are going to go down, which is what CMS is calling the MIPS track, or the Merit-based Incentive Payment System. The other track is the Advanced Alternative Payment Model side. The interesting thing to note is that people can jump back and forth between these tracks, depending on qualifications, or depending on enrollment periods. So these paths will eventually come together as options. It’s almost like, you’re getting on an HOV lane, and you can get off if you want to, but you can also get back on that HOV lane if you decide that the track I’m on now allows me to go back and take on some more risk. So let’s focus on MIPS. MIPS is really where CMS really believes most of the folks are going to go down. It’s really that track that is going to focus on almost every single provider in this country, other than the ones that might need an exception, such as billing less than $30,000 with fee-for-service Medicare, or have 100 or less patients, maybe they’re an FQHC or an RFC, or maybe they’re in an Advanced Alternative Payment Model, or this is their first year of running their practice on their Medicare eligibility. For everyone else, you’re going to report under MIPS. MIPS includes four options, it’s allowing you to focus on taking in that Meaningful Use criteria that’s being rebranded now, it’s being called Advancing Care Information, or ACI. PQRS is being rebranded as Quality. And, of course, your Value Modifier’s going to be rebranded as Cost, with the inclusion of this new category called improvement activities. We’ll talk a little bit about APMs, I’m guessing, a little bit later, so we’ll table that for a little bit later in the discussion. Adam: Of course, yeah, we’ll get into some more details about that. But we should probably mention that APMs, or Advanced Alternative Payment Models, really do the same things that we mentioned, those same four categories, but it’s almost like CMS is outsourcing that measurement and that management to these Advanced Alternative Payment Models, which is why you can get out of the MIPS track, if you’re in a qualifying advanced APM. How is the performance measurement, and how is the management of this program, different than in previous years, or in previous programs? Rohan: That’s a very common question we get asked. ‘You’re telling me, Rohan, that this is very similar to what I used to do, but there must be something different.’ So, the key difference is what we’ve already talked about — the consolidation of these three programs. So now instead of looking at PQRS as a program itself, looking at Meaningful Use as a program itself, and looking at the Value Modifier as a program in itself, under MIPS, CMS is combining these three programs into one single program called the QPP or the Quality Payment Program. So what essentially is going to happen here is, it’s sort of like a mathematical equation. Every practice is going to get a score, at the end of the reporting period, and that score is going to be dependent on these individual variables, so each of these variables hold a certain amount of weight, and these weights change as we progress through the program. Some increase and some decrease. Eventually, your individual score within these categories apply to your final score. So think of it as a semester-long course you’re taking, and you’re taking multiple classes. Eventually your grade point average, in the end, is dependent on how you perform across the board in those categories. To simplify things under MIPS, we’ve got a Quality category, which is really your PQRS category that makes up 60% of the overall weight. We’ve then got an ACI category, or Advancing Care Information, which is nothing but Meaningful Use, which makes up 25% of the overall weight. And then you’ve got your final category, in 2017, which is new for most people, but those in Patient-Centered Medical Home it’s something they’re very used to, called Improvement Activities. And these are really just process and protocol changes that are being applied across the board. There’s that little cost component that we haven’t talked about, which actually is still being calculated by Medicare, but will not be applied into the practice score measurement calculation in the year 2017. And the other big difference, Adam, is that the negative payment adjustment in this consolidated program is actually much lower than if you were to consider these three programs individual of each other. If we looked at PQRS, Meaningful Use, and the Value Modifier as three separate programs in the pre-MACRA world, you could stand to lose almost 11% of your overall payment structure, versus under MACRA, where we consolidate this, the maximum you can lose is really 4% — that’s for practices who are just going to say ‘We’re not going to do anything with MIPS.’ Everyone else should be just fine under this new MACRA legislation. Adam: And while you’re measuring these adjustments, it’s important to note, I think, that, as opposed to Meaningful Use, where practices were paid, maybe a lump sum incentive, based on their collections. Now, under MACRA, there’s going to be a performance year, where they’re measured on their activities and their quality measures, etc. And then, later on, two years after that, will be a payment year, so there’s a lag between your performance and your payment. And, instead of that lump sum, the payment year will be adjustments to each of your claims that are submitted. So if you make a positive adjustment, all of your claims will have that positive adjustment, and if you have a negative adjustment, all of your claims will have that negative adjustment, as well. And then, while we’re talking about performance, this is also a little bit different to programs that have been in the past because we’re not going to be evaluated in a vacuum, is that correct? Rohan: Yeah, you’re going to be now compared against your peers across the entire country. So, again, to use a college or a school analogy, you always hope for the curve shifting in your favor, when you score poorly, right? But if you were in those situations where you’re sort of in the average, but the average is actually really good. It’s sort of what’s going to happen with MACRA, as people are going to start to become better about these things — whether it’s quality, whether it’s improvement activities, whether it’s care coordination, care management, putting people in place — this herd mentality of people actually delivering better care towards value is going to start to shift the curve more right, which means that average point of maybe in year one, when we talk about reimbursement, which will kick in in 2019, you might be in that +4% of an increase, but if you don’t keep up and you don’t improve, basically, you don’t want to become complacent just because you’ve achieved that highest level in year one, because things are going to move in the direction of the positive versus the direction of the negative. Adam: Continuous improvement is a theme there, and that’s all the more reason for practices to get started sooner rather than later, making sure they’re aware of these things and understand these things. Now, let’s talk about getting started sooner or later. CMS has given practices some flexibility here with how they begin to transition into this program. Rohan: Yeah and this was one of the things CMS received the most amount of comments on. When the initial ruling of MACRA came out, it was an all-or-nothing start, January 1, 2017. And the guys at CMS did a really good job of keeping the comment period open — there were almost 50,000 or 5,000 individual comments that were received from organizations like the AMA, the AAFP, consulting companies, House Republicans, House Democrats, they all actually commented on the MACRA legislation, to which Andy Slavit, a couple days or couple weeks before the final ruling came out, put out a blog post and said ‘We at CMS are going to allow practices to take a little bit of a phased approach to reporting under MACRA, or specifically under MIPS.’ And when the final ruling came out, we got more light of that. Basically, what CMS is saying is that if you are a provider or if you are a practice, you are now going to get four options to pick from for reporting under MIPS. We’ll give you option 1, which is basically do a little bit of something. If you just select one quality measure, you will at least be guaranteed a plus .5% increase in your payment modification that will kick in, in 2019. This is really just for those practices that just feel like they’re not ready, maybe they’re in a shift year or a transition year. CMS is calling this an ‘on ramp’ year, it’s really sort of like you’re on the on-ramp to get the main highway which will be 2018 and onwards. So it’s really giving you a slow approach onto the big scale of MACRA. You pick any period of time and as long as you pick your small 90-day period and pick one quality measure, you’ll avoid that negative adjustment. Under option 2, CMS is saying this is for practices that feel like they want to test their model out, essentially for those practices that might introduce new processes and protocols in the first half of the year, and start to report for MIPS into the second half of the year. So these are for those guys who believe in that feedback loop mechanism. They’re going to put in a practice — by practice I mean a protocol change, quality measurement calculation — and then towards the second half of the year, they’ll select their 90-day period, pick their quality measures that they want to report on out of the 270 that are available, report under the ACI, might pick some Improvement Activities, and start to see what’s working and what’s not working, so they can go back and modify. Option three, is where CMS actually believes most practices are today, but not maybe all of them will report under this category. And these are for those guys who believe they’re 100% ready to go, which means you have your minimum 90-day period, but the longer date range you select, the likelihood of you getting that positive payment adjustment is that much higher. So you would pick the most amount of Quality Measures, you would pick your biggest date range, and you would more than likely see a pretty substantial increase in your payout structure starting 2019. And the last one, Adam, is the Advanced Alternative Payment Model side. So, it’s like, you’re a provider and you don’t really want to take part in, we’ll call this a conundrum under MIPS, you would fall under the Alternative or the Advanced Alternative Payment model side, where you’re in an ACO or in a CPC plus region, or you’re in one of those bundles or PCMH-type models, you can enter into these programs, beginning 2017, 2018 and basically bypass the MIPS initiative. Adam: We’re gonna break this podcast up into two parts, so make sure you come back for part 2, where Rohan and I plan to discuss MACRA, MIPS, APMs, what it means for you, our viewers, and our clients. You can check out our other podcasts on YouTube, iTunes, or my.eclinicalworks.com. For the eClinicalWorks podcast, I’m Adam Siladi. 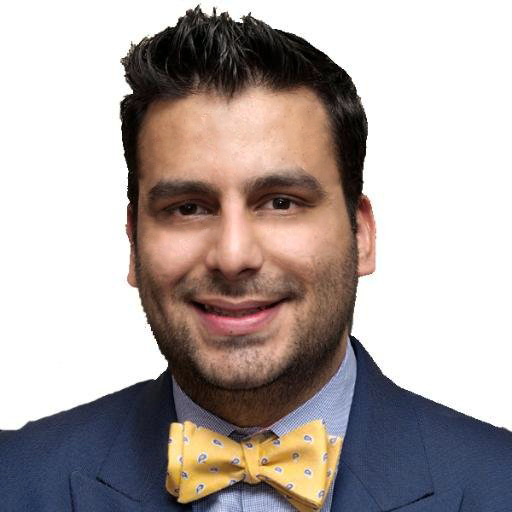 Adam: Welcome to the eCW Podcast, this is part two of a conversation with Rohan D’Souza about MACRA, MIPS and what it means for you, our viewers, and our clients. Before we get into our APM discussion, just to round out our conversation about the MIPS area, and the different measures and activities that you’ll be asked to report on — I think you mentioned that CMS did a lot of listening to practices. I think it’s also evident in the fact that they’ve expanded or made available a lot of choices there, in the quality component, in the improvement activities component, so that practices can really pick and choose which activities either line the best with what they’re doing now, line the best with where they want to go and what’s important to them or important to their patients, and figure that out. Let’s just use the example of a dermatology practice, because I had a dermatology practice speak with me at our National Conference about their concerns regarding this, and under PQRS — which is now Quality in the MACRA program and MIPS component — they said under PQRS, they only had four measures to choose from, so that was very difficult and some dermatology practices might not even do all four of those. If we look at the Quality measures that are available under MIPS, there’s actually 11 that are specific to dermatology, so it’s more expansive there, and then the Improvement Activities category, there’s 93 options to choose from, which you only need to pick one to four, essentially. And some of those are generic and apply to any specialty, no matter who you are. So there’s a lot of choice and flexibility there, it’s not like what we were seeing with Meaningful Use, where practices were complaining that they were being put into a box that didn’t mean anything to them. So I think there’s a lot of improvement there. Adam: And additionally, CMS has also said that they’re going to be reevaluating which measures are available every year. So, if you find that something doesn’t work the way that CMS thinks it works or you think there’s something additional that you think would be more applicable and beneficial to your specialty, subspecialty, to medicine in general, you can put that forward and CMS, as we have seen, will likely listen to that. So let’s get into the advanced APM discussion, now. If providers find themselves part of one of these organizations, they can avoid reporting under MIPS because, as we know, they’ll probably be doing much of those activities already. Let’s talk about what defines an APM and then what makes an advanced APM different, and we can start to discuss whether providers might be a part of those and what they’ll see, as a result. Rohan: Yeah, great question. It’s gotten a lot of discussions across the board, especially sinc ACOs have become more mainstream, starting in 2012. APMs essentially are alternative payment models. It really defines the very word of Shared Savings and a reimbursement based on cost reduction/improvement in quality. So, if you look at the IHI triple aim, all of the APMs focus around achieving the triple aim, right? How can I deliver a better value of care, at a lower or a controlled cost level, by not compromising on patient satisfaction? And that’s what APMs really focus on. There are some requirements there — you have to use a certified Electronic Medical Record, you must have care coordination in place, etc. What makes an Advanced APM, is when you start to take on this model of dual-sided risk. Essentially, you are now on the hook — you as a provider or an organization that is taking part in this Advanced Alternative Payment Model, you’re on the hook with the sponsor. So, the sponsor might be Medicare, through the ACO model, or it could be a large health plan like United or Blue Cross or Humana or Aetna. Essentially, if you increase your cost, you are now not only having to pay a fine, but you’re sort of put in that category as an ACO that increased cost and paid a fine over to CMS. So you’re taking dual-side risk. The reason why CMS is saying that ‘We’re going to give you that blanket 5% increase with that payout structure, if you are in an Advanced Alternative Payment model side, starting 2019.’ One on side it might look great, Adam. You might say ‘Why do I even have to bother now, with MIPS?’ The worry that I might get an increase in 2%, 3% or 4% versus if I just go to the Advanced Alternative Payment Model side, I’m going to get an increase in 5%. The reality is, you’re on the hook now. You’re on the hook for paying back fines if you increase your costs. So, while you might be getting an increase on one side, you might be having to pay fines on the other side. If you’re not doing things around the triple aim, if you don’t have care coordination in place, if you don’t have constant communication back and forth between your patients, working with your acute care locations, your hospitals, your reductions in ER visits, you might be increasing costs that you might not even know, and having to pay a fine towards the end of the year. 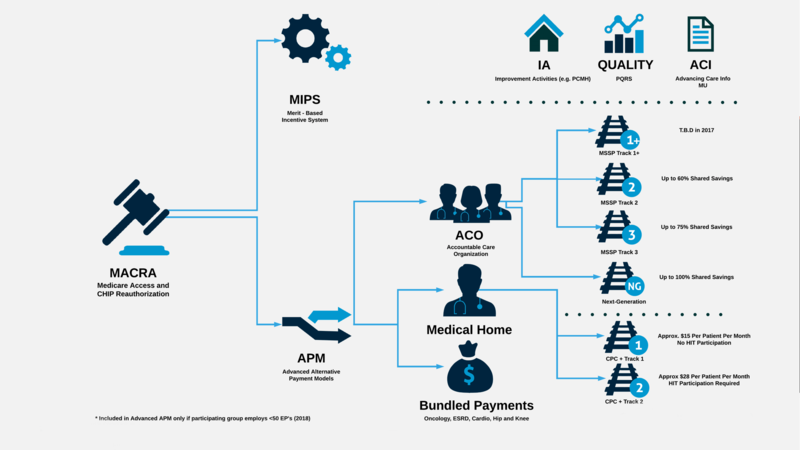 So, the Advanced Alternative Payment Models that we’ve talked about are the MSSP track two, track three and the next generation ACO — most ACOS today are in track one. About 90% of MSSPs, there’s around 400 of these, today are the single-side risk model, which is Track One. And what CMS has said is that Track One doesn’t qualify as an Advanced Alternative Payment Model, it just qualifies as an Alternative Payment Model. So while you might get some discounts on the MIPS side, where quality might not be 60%, it might be 50%, things like that, you’re not going to get that additional 5% blanket that you might get under the Advanced Alternative Payment side. So, CMS is introducing a new program, starting in 2018, with rules to come out in 2017, called the MSSP Track One+. It’s basically a program that will allow folks in the Track One MSSP today to switch over to Track One+, or allow folks to newly enter into the track plus MSSP, where there will be a little downside risk — not as high as it is in Track Two, certainly not as high in Track Three and definitely not as high in the Next Generation ACO, but it will allow them to then take on that dual-side risk model and get that 5% payout. So I would tell practices to pay close attention to that starting in 2017. And then, of course, if you’re one of those fortunate practices that got selected in one of the 14 regions of CPC-plus, whether you’re Track One or you’re Track Two, not only are you getting an investment model to stand up care coordination, but you’re also avoiding MIPS, and you’re applying now under the Advanced Alternative Payment Model side. Adam: So you mentioned, yes there is some risk involved, and certainly we’ve seen that some ACOs have ended up owing CMS some money, but I think it’s clear that CMS is betting that this is the way to go, by better coordinating with other practices, whether it be by joining a large organization, or forming some sort of a loose, independent physicians association type of thing. I think they’re betting that, that additional communication, additional coordination, additional sharing of information is going to lead to reductions in cost. That’s the power of a network, your efforts are amplified by the other people in the network. And to that end, CMS is also introducing, or considering introducing the concept of forming a virtual group in 2018, and for groups that are not part of an APM already, but maybe don’t feel like they can go it alone, or don’t feel like their reporting is going to meet all the quality metrics, they can join a virtual group or form a virtual group where they can report with other practices, aggregate their MIPS scores, and be reimbursed, basically on the score for the entire group. So, I think that’s kind of evidence CMS is hoping that practices will move in this direction, even if they still try to remain independent. So, I guess the final question that we really want to talk about, or one of the final two questions we want to talk about is what is eClinicalWorks doing now or what are we planning to do in the near future to support this and be ready for this? What can we offer to practices? Rohan: Yeah so, Adam, let’s categorize this into three P’s, right? So, we’ve got the people, in addition to you and me understanding these rules. There’s hundreds of folks here, in the background here, all over this building, all over the country, that have really spent a lot of time understanding the subtle nuances within MACRA. Whether it’s the MIPS piece, whether it’s the APM piece. So, rest assured that practices can depend on eClinicalWorks’ staff to help them throughout this process and remove some of that anxiety. Let’s talk about product now. So, at the end of the day, we are a software provider for mostly all of our listeners, and for a large percentage of independent docs across the country that are interested in ‘What is eClinicalWorks going to do for me to make sure the software is certified?’ There’s pieces in place. 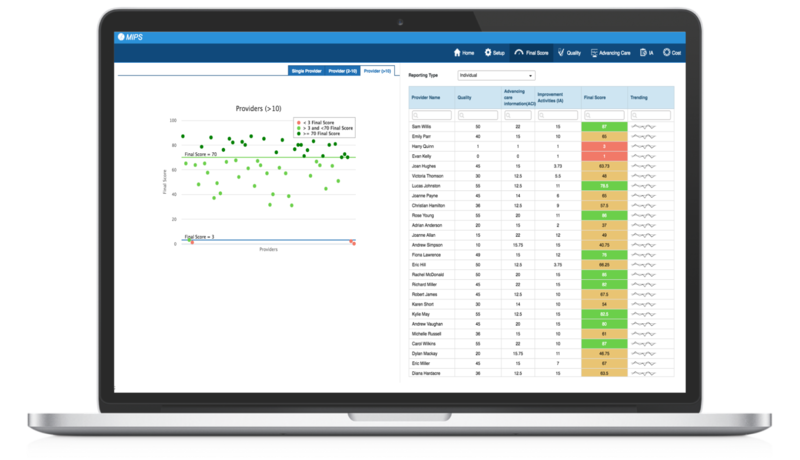 So, on the product side, if you were at our National Conference, you have heard that we’ve introduced a MIPS dashboard. The dashboard will be available right away, on January 1, starting next year, where practices will be able to see all of their components in one single view, whether it’s the ACI component, whether it’s the Quality component, whether it’s the Improvement Activities component, integrated directly into their EMR, to allow them to see how their providers are performing, how their groups of providers are performing, or how their entire health system is doing. We’ve always supported the submission of quality measures, as a data submission vendor. We’ve been doing this many years now with PQRS, and we’ll continue to do that, we’ll continue to help practices submit measures over to CMS, whether it’s QRDA, XML, whatever format CMS comes up in, rest assured eClinicalWorks will be on top of that. And then there’s more cutting-edge technology we’re putting in place, right? If you’re in the Advanced Alternative Payment Model side, you need to understand your HCC coding — how is that going to impact the risk scoring of my patients? What are the gaps in care? How do I make sure I get that high benchmark or that sustained benchmark, so I can work with that truly capitated model, of working within that budgeted amount set aside for this patient? If I don’t code you at the highest level of specificity, CMS is just going to think you’re the average Medicare patient, when in reality, you might be a patient with multiple co-morbidities and interaction factors between these co-morbidities will change reimbursement. So we’re helping practices with people that will help practices understand what is HCC coding? How does that impact their workflow? But then also from a product perspective, how do we look at risk scores at the point of care? How do we get notified of opportunities at the point of care? Quality measures — things like looking at your HEDIS scores, looking at your other metrics, are all things that we’re putting in place from a product side. And, of course, we have a fantastic care management and care coordination embedded right within the EMR — care managers, care coordinators, your chronic care nurses, can all look at this at the standpoint of what’s happening with their patient and track that throughout the continuum of care and not just look at a single encounter. And the last P, Adam, is process — how do we take all of these and put it together into a protocol and a process? In fact, right on this floor we’ve got our business analyst team, which you’re a part of, that focuses on things like optimization services, really comes in and helps practices understand — are you Patient-Centered Medical Home? Maybe you’re not Patient-Centered Medical Home, let me help you become Patient-Centered Medical Home, so you get 100% on the improvement activities and you bypass that track, right? That’s really where the rubber hits the road, it’s not just product existing in one place and people existing in the other place, it’s how can we marry these two together, along with our listeners and providers into one unified process? And that’s what eCW is doing. Adam: and then the last question – now we know that eClinicalWorks is doing, what are our viewers supposed to do? What do providers and the offices and organizations supposed to do, first, when we’re headed into MACRA? Rohan: Well, the first thing I will tell our listeners is ‘Don’t be scared.’ There’s a lot of nervousness out there, we’re hearing some stories of how practices are saying ‘Oh my god, am I going to be able to continue to maintain my small, independent provider office?’ You know, whether you’re in a densely populated metropolitan area or in a small-town rural America, don’t be afraid. MACRA is nothing but a modification, and it’s very easy to make it sound like it’s overly complicated. That’s the first thing I will tell our listeners, is not to be afraid. Second is just get educated, listen to things like this podcast, listen to eClinicalWorks’ webinar, maybe talk to your local community resources — health systems that might be in place, your professional organizations. Most providers today are part of either one or multiple professional organizations that are conducting these similar webinars and podcasts on MACRA. And the third thing I’ll say is do something, do at least the bare minimum to avoid that negative payment. Like we talked about under option one, reporting with MIPS, do even one quality measure and you’ll avoid the negative payment adjustment. Look at forming an ACO, look at people getting together to take some amount of risk, because you can do that in today’s modern medicine — of having technology, of having people, of having a consumer that understands this whole idea of risk. Working with hospital systems, skilled nursing home, home health, form an Accountable Care Organization. CMS is making this a lot easier to do today, than it was in the past. You guys got this, this is not overly challenging. And we’re going to help practices to really navigate this and be successful at it. So, that’s my message. Adam: Well, Rohan, hopefully our viewers feel a bit more confident, a little bit more informed after our discussion here today. Thank you very much for all of that. As Rohan said, you can check out our webinars on my.eclinicalworks.com, speak with your SAM, put in a ticket, whatever you need to do. 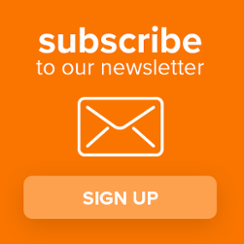 Get in touch with us if you have questions, we’ll be happy to answer those for you. You can also check out our other podcasts on YouTube, iTunes or my.eclinicalworks.com. For the eClinicalWorks podcast, I’m Adam Siladi, thanks for watching.